Part A includes debt which can be serviced from the existing operation while remaining will be classified as Part B. There will be no extension for the repayment of Part A and Part B will be converted into equity/redeemable cumulative optionally convertible preference shares. In case the resolution plan does not involve change in promoter banks may convert a portion of Part B into optionally convertible debentures. The project has commenced commercial operations. The aggregate exposure (including accrued interest) of all institutional lenders in the account is more than Rs.500 cr. A debt level will be sustainable if the Joint Lenders Forum (JLF)/Consortium of lenders/bank conclude through independent TEV report that the debt of principal value among the currently funded/non-funded liabilities owed to institutional lenders can be serviced over the same duration as that of the existing facilities even if the future cash flows remain at their current level. Techno-economic viability (TEV): An independent agency will have to conduct a TEV report to assess the amount of the sustainable debt and a resolution plan should be agreed upon minimum 75 percent of lenders by value and 50 percent of lenders by number in the consortium. Once the resolution plan is decided it will go to the overseeing committee. An Overseeing Committee (OC) comprises of eminent persons and will be constituted by IBA in consultation with RBI. The members of OC cannot be changed without the approval of RBI. The resolution plan shall be submitted by the JLF/consortium/bank to OC. The OC will review the process involved in preparation of resolution plan. There will be no fresh moratorium granted on interest or principal repayment for servicing of Part A. There will be no extension for the repayment schedule or reduction in the interest rate for servicing of Part A, as compared to repayment schedule and interest rate prior to this resolution. Part B shall be converted into equity or redeemable cumulative optionally convertible preference shares. If the resolution plan does not involve change in promoter, banks may at their discretion convert a portion of Part B into optionally convertible debentures. Break-up value is applied from the company's latest audited balance sheet. If latest audited balance sheet is not available then the shares are to be valued at Re.1 per company. The independent TEV will assist in ascertaining the break-up value. Discounted cash flow method in which the discount factor is the actual interest rate charged to the borrower 3%, subject to floor of 14%. Further cash flows occurring within 85% of the useful economic life of the project only shall be reckoned. Redeemable cumulative optionally convertible preference shares/optionally convertible debentures -The valuation should be on discounted cash flow (DCF) basis by the weighted average actual interest rate charged to the borrower by the lenders. Change of Promoters: In case a change of promoter takes place under the resolution plan then asset classification and provisioning requirement will be as per the SDR scheme or outside SDR scheme. No change of Promoters: When there is no change of promoters the lenders will have to make higher provisioning at 40% of the Part B Debt or 20% of the total outstanding debt whichever is higher. The lenders may upgrade the account to the standard category after one year of satisfactory performance of service of Part A Debt. The new S4A scheme is a success for both the banks and as well as for promoters. It would be positive for the stressed sectors and also for the PSU banks. This scheme provides the banks a greater flexibility to structure the stressed assets. 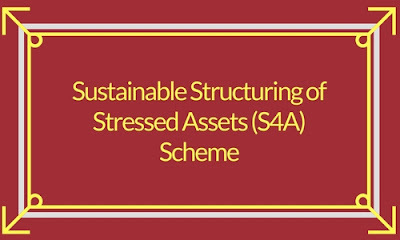 These are the important facts about the Sustainable Structuring of Stressed Assets.